Retrofuturism: The Year 2000 and Beyond! In honor of the new decade, our friends over at Brain Pickings have put together a delightful collection of vintage images and videos revealing hopes and dreams of what the next millennium would look like. 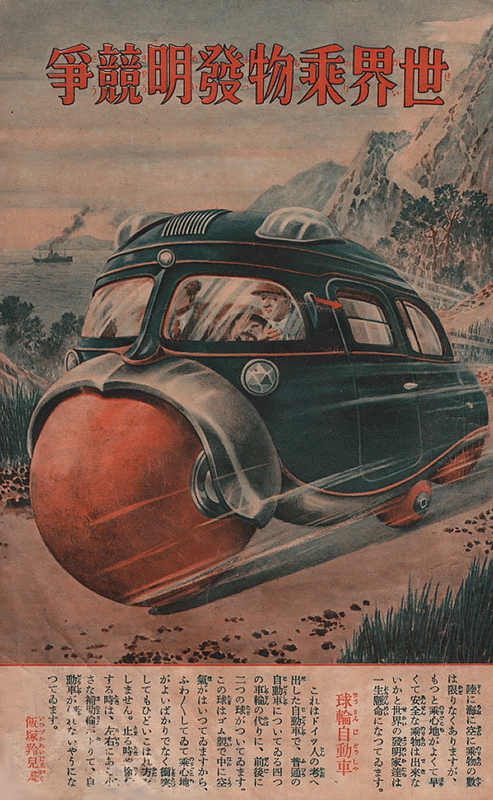 Reiji Iizuka's sphere-wheeled car, based on a concept by a German inventor. From Shonen Club magazine via BrainPickings.org. Apparently, in the 1930s, according to an illustrated magazine series, the Japanese thought we would have a slender propeller-run monorail train and a car with an enormous rubber-ball for a front wheel/bumper by now. All in a sleek Art Deco design, naturally. The post touches on Walt Disney’s Tomorrowland, with a video of Disney himself enthusiastically endorsing robots and the NASA space program, as well as strange “hallucinatory” painting of urban landscapes that bring to mind “Blade Runner” and “Star Wars.” Other videos from the ’60s and ’80s give a fairly accurate predictions about video chat and the Internet—although it’s easy to snicker at the low-tech retro imagining of what we have now. The last video calls to mind the hysterical “ALT/1977: We Are Not Time Travelers” art project by Alex Varanese, wherein he envisions taking a time machine back to the days of Atari, Apple II, and Walkmen, and conquering the world with MP3 players, cell phones, and laptops in wood-paneled orange-and-brown-striped packaging. My favorite, though, is a 1930s take on women’s (and men’s) clothing in the year 2000. Get prepared to have your sides split with laughter (“One designer goes so far as to believe that skirts will disappear entirely, shoes will have cantilever heels, and an electric belt will adapt the body to climatic changes!”). Welcome to the year 2011! We don’t have flying cars or jet packs, but as the space shuttle program prepares for retirement, we do have the Raygun Gothic Rocketship on the Embarcadero in San Francisco to remind us of the space race and the days when the possibilities of technology seemed endless. “ ” I’d never even met a poster collector until I moved to Seattle. I thought I was the only one.